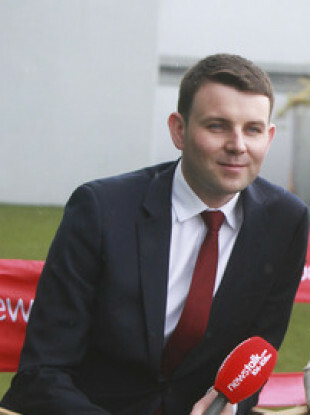 Donoghue has been a member of the Newstalk roster for 14 years, and was appointed as group political editor for Communicorp less than three months ago. BROADCASTER CHRIS DONOGHUE is leaving his job at Newstalk to take up a post next to Simon Coveney in the Department of Foreign Affairs. Prior to that, Donoghue presented the Drivetime evening show on Newstalk with Sarah McInerney. The duo presented the show for just over a year before being moved to different slots when Ivan Yates took over the programme in September. Donoghue was given a two hour show – On the Record with Chris Donoghue – on Sunday mornings instead. He is perhaps best known for presenting the Breakfast programme on Newstalk with Yates for a number of years. A spokesperson for the Department of Foreign Affairs confirmed that Donoghue is set to take up a role as second special advisor to Minister Simon Coveney. Commenting on his departure from the company, Communicorp CEO Adrian Serle wished Donoghue well in his new role. “On behalf of everyone at Communicorp I would like to thank Chris for his hard work and dedication over the years and wish him the very best in his new role,” Serle said. “Chris is a big part of the Communicorp family, having started out in the Newstalk newsroom 14 years ago. Since that time, he has become one of the country’s most successful broadcasters through his work on Newstalk Breakfast, Newstalk Drive and most recently in his role as Group Political Editor for Communicorp. Donoghue thanked the station for its support over the years. “After 14 very happy years at Communicorp an opportunity to take on a new challenge has come up and I have decided to go for it,” he said. I am looking forward to the next chapter and would like to thank all my colleagues in Newstalk and Communicorp for their support over the years. Donoghue will present his show for the final time tomorrow. Email “Broadcaster Chris Donoghue to leave Newstalk for government job alongside Simon Coveney ”. Feedback on “Broadcaster Chris Donoghue to leave Newstalk for government job alongside Simon Coveney ”.